A convection oven has several advantages over a standard oven. While a standard oven uses radiant heat that comes from the heating elements and the oven’s interior walls, a convection oven has a fan that blows pre-heated air throughout the baking chamber. 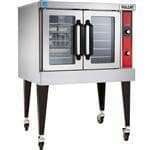 This allows the convection oven to spread heat more evenly, eliminating hot spots and reduces the chance of undercooking some items and overcooking others. If you’re using a high-quality convection oven, you can bake multiple racks of cookies and they will all cook evenly without the need to rotate the baking sheets in the middle of cooking. A convection oven also reduces cooking time by as much as 25% to 30%, allowing busy commercial kitchens to supply more food products in a shorter period of time. And because the cooking time is cut down by a significant fraction, a convection oven produces food that is crispier on the outside and tastier and juicier on the inside. That’s certainly an advantage when you have a lot of customers constantly clamoring for good food served right away. Countertop ovens are compact, allowing them to be used in commercial kitchens where space is constricted, such as convenience stores, concession stands, and offsite catering sites. Their size makes them easy to transport and install. Most convection ovens can accommodate several half-size sheet pans. Floor models come in half-size or full-size. Some models also come in bakery-depth so you can load full-size sheet pans front to back. 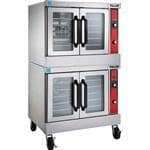 Some convection oven manufacturers design their units to be stackable, allowing you to double your production without taking up more of the floor space. Many convection ovens provide you the ability to turn the fan on and off. This is especially important if you need to bake delicate items, such as cakes and soufflés, which may not hold up against the force of hot, blowing air. More expensive models also let you adjust the speed of the fan, which is useful if you want to have more control over the speed of the air blowing through the baking chamber. Convection ovens cook faster than standard ovens so you may have to adjust the temperature and cooking time of your recipes. Some premium models have a feature that automatically adjusts the temperature and cooking time of your recipe. Some convection ovens have a cook-and-hold feature that will switch the oven into holding mode. This keeps the cooked food at the desired serving temperature without burning it. 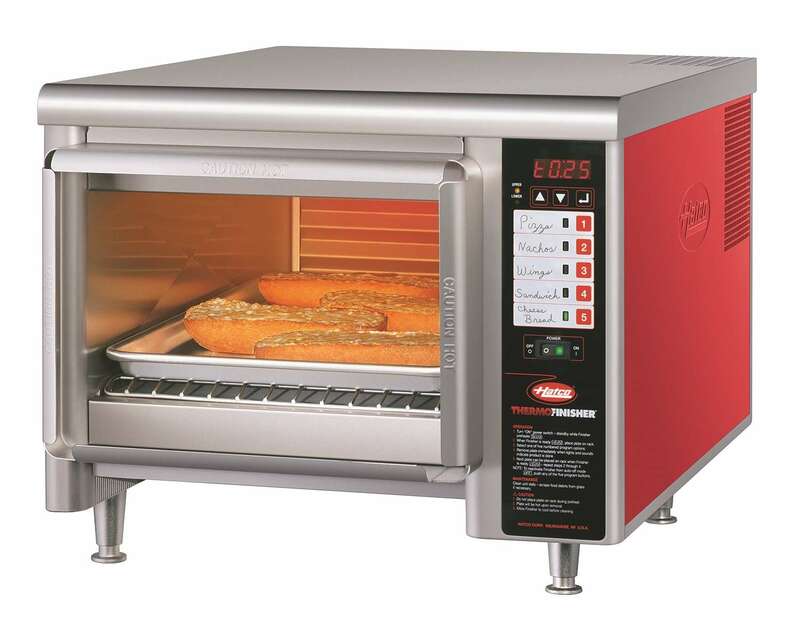 Some convection ovens have a feature that allows you to circulate steam around the baking chamber. This is helpful for making artisan breads that have shiny golden brown crusts and moist, fluffy insides. Steam also helps keep meats such beef and turkey juicy without you having to add too much oil or seasoning. Ovens with a steam function need access to a water connection. You may also want to consider installing a water filter or softener to ensure that the water quality in your area does not affect your finished product. Convection oven controls can either be manual or programmable. Programmable controls allow you to create recipe programs that can be activated with a single push of a button. This is helpful if you have a lot of unskilled labor in your staff. Manual controls, on the other hand, provide operators with a lot of flexibility. Professional chefs prefer manual controls because it lets them adjust their cooking settings as needed. Convection ovens are typically made of stainless steel or galvanized steel. Stainless steel, which is corrosion-resistant, is the material of choice for those who plan to use their ovens for heavy-duty applications. Galvanized steel is a more affordable option, although it is not as corrosion-resistant as stainless steel and will not last as long. Another factor to look at is how the metal panels are held together. High-end models use welded steel, which holds better than bolted models. Convection oven interiors are typically made from aluminized steel, which is the most economical option that doesn’t compromise on strength and durability. Some ovens have porcelain interiors, which are smooth and easy to clean, thus reducing the growth of bacteria that can occur from uncleaned food spills. However, porcelain interiors can crack or wear out faster than aluminized steel. Some interiors also have smooth, coved corners, getting rid of the straight edges and corners where food spills can gather and create bacterial growth. Convection oven doors can either be made from tempered glass or solid metal. Tempered glass doors let you look at the contents without opening and letting the heat out. Solid doors, on the other hand, are more durable and have better heat retention. However, constantly opening solid doors to check on your products could lead to heat loss and higher energy costs. Doors can also be dependent or independent. Dependent doors open at the same time using a single handle. They let you open both doors with one hand only, which is useful when you’re holding a tray of food products with the other hand. Independent doors are not as convenient because they have separate handles. The advantage of independent doors is that they don’t produce as much heat loss as dependent doors. Determine the oven size you need. The size of the convection oven you choose depends on how many food products you need to prepare every day. Larger convection ovens will obviously fit in more products, typically holding up to 9 to 12 sheet pans at one time. 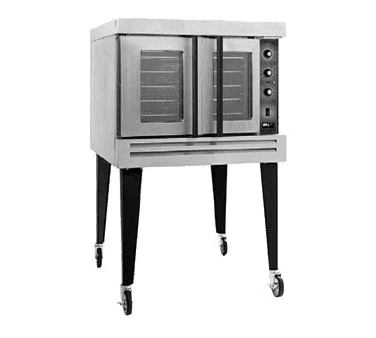 Most commercial convection ovens can accommodate 2 ½” deep pans, with adjustment for 4” pans that are used for taller items such as breads. 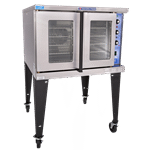 If your business is rapidly growing and you anticipate that you may need more convection ovens in the future, consider going for a stackable model so you can save floor space. Choose between gas and electric options. Convection ovens rely on gas or electricity for fuel. Gas convection ovens typically heat up more quickly. However, even gas-powered ovens will need to have an electric connection to power their fan motors. For many commercial kitchen operators, electric convection ovens are the more viable option. Electric ovens can provide more uniform temperatures that result in uniform cooking. In some areas, however, electricity can be cost-prohibitive, which is why manufacturers still provide gas options for their customers. Get the proper ventilation system. Before you purchase a convection oven, make sure you have the right commercial hood and other ventilation equipment in place. Check the local regulations and be sure that you are in compliance with all kitchen ventilation rules.